The Beach House -- 3 Bedrooms, sleeps 9, 2 baths, low bluff - AWESOME BEACH!!! 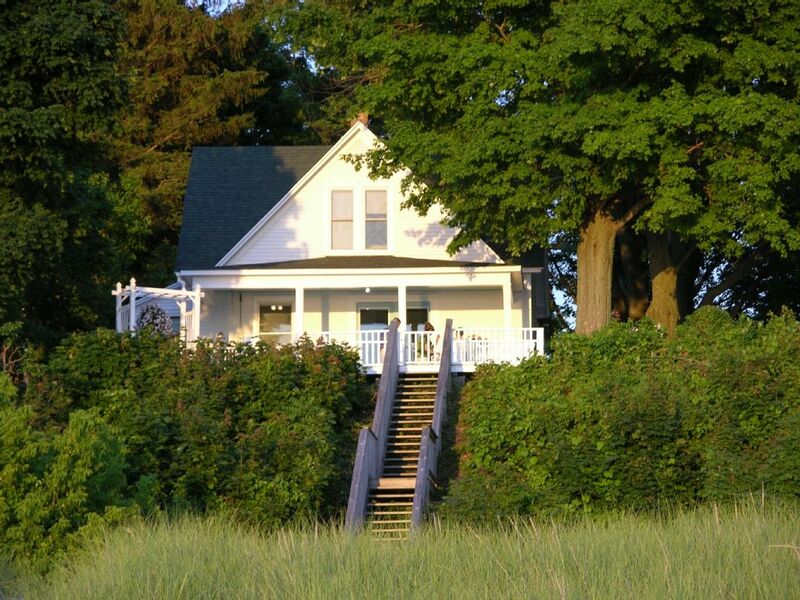 Cozy cottage sits on low bluff overlooking 70’ of private Lake Michigan beach. Stairs from deck lead to sea grass, sugar sand, and shallow water with sandbars. Great place for sand castles during the day and bonfires in the evening. Built in 1910 and recently updated, the original arts and crafts interior includes wooden ceiling beams and hardwood floors. Three bedrooms (two upstairs; one downstairs) sleep 8 comfortably. Wide front porch overlooks lake and deck . Amenities: Fully-equipped kitchen (remodeled 2011) includes electric range, double oven, dishwaher, soapstone countertops and floor tile. Separate dining area seats 8-10 comfortably. Sitting area has Cable/TV/ DVD, stereo CD/cassette player, and docking station for iPod/iPad. House provides unlimited local phone calls and WiFi Internet access. AC provides comfort in the summer, but don’t miss out on the great cross-breezes from the Lake. Linens provided, along with kitchen equipment, lawn chairs, beach toys, games, videos, and many, many books for all ages. Bring your own beach towels! Things to do! : Large shaded back yard (70’x150’) provides lots of space for games and seating area for family and friends. Shed is stocked with beach toys and lawn chairs. Take a ¾ mile walk south from the house along the beach to look at the South Haven light house or people watch on North Beach. Head north from the house along the beach to look for sea glass and view steep Lake Michigan Bluffs. Walk or bike across Dyckman bridge and into town (1.25 mile). Shop at local art galleries, food shops, and antique stores in town, or take a 15 minute drive to Saugatuck/Douglas area for more shops and restaurants. Visit one of the local vineyards, and De Grandchamps’ blueberry farm. Pick seasonal fruits in surrounding area. Play golf at public or private courses. Charter a fishing boat or sail with Friends Goodwill--a 3-masted schooner and historic replica. The water sport shop on Dyckman offers a good selection of sports rentals, from paddle boards and jet skis to kite boards and kayaks. Great location! : South Haven is about 2.5 hours from Chicago and 2.5 hours from Southeast Michigan. It’s a great place to meet up for families scattered across the Northern Midwest. Nightlife includes fireflies and shooting stars, bonfires and ghost stories. Good pubs and restaurants also available in downtown South Haven, or close by in Saugatuck, Douglas, and Holland. List of recommended pubs and eateries available in welcome book at house. We started renting properties in South Haven when our oldest was five years old. As time went on, it became more and more difficult to find properties with good beach access. Then this property became available....and we snapped it up! We are happy to share our cottage with you and welcome you to South Haven! The house is a piece of South Haven history with modern conveniences. Dating from a time when families traveled by ship from Chicago to the sandy shores of western Michigan, this house displays the Arts and Crafts style of 1910 when it was built. The porch overlooks the amazing lake Michigan -- a view that has been enjoyed from this location for a century! Open the french doors and the lake and shoreline become part of the house. The waves lap against the shore all day long and lull us to sleep at night. Steps to the beach. House sits on a low bluff. Please bring your own beach towels - washer/dryer provided. There are kids sand toys in the shed. There is a nice store called Outpost Sports at the corner of Dyckman and North Shore Drive that has paddle boards, kayaks, beachwear and all manner of water toy rentals. It's an easy 4 block walk. The nostalgic cottage was the perfect place for a family vacation. Beautiful views coupled with easy beach access and a table made for several rounds of Monopoly, made this a wonderful place for a family vacation. We can’t wait to come back! Charming beach cottage with great location and views! Hosted a girls reunion weekend this past weekend and this place provided the perfect location to relax and reconnect. Charming and full of character, clean and with all the amenities needed for a very nice stay. Highly recommended! This property has an amazing view, and a house full of character and charm! We loved it. The view was unbelievable, the house totally stocked with everything we needed. Clean and Cozy yet plenty of room for 8 adults I really can't say enough good things. I would rent it for a month if I could. Thank you! I wish I could be there an entire month, too! I am so happy to hear that you enjoyed your week, and we certainly will look forward to your return. Our group of 7 greatly enjoyed our stay. Despite this being a smaller house, I would say it would accommodate one more comfortably. The house has much charm and is quite unique vs the other houses being built/updated in the area. The major selling point is of course the private beach. Having a late night fire in front of the black background of Lake Michigan is one of those experiences you will never forget. I can't wait to do that again! Nice to hear from you! The lake is ever present at our cottage. It's the first thing I look for in the morning, and the last thing I hear when heading off to bed. The darkness of the lake at night is an awesome experience. I hope some day you also get to see the moon set over the lake--very eerie and very beautiful -- but you have to get up early to see this! The location and view directly on Lake Michigan, with a private stretch of beach, plus the house itself, make this a great getaway. Loved the restored cottage/home and all the modern updates. Kitchen is fantastic, as we cooked a ton while we were there. Fully equiped, plus two grills. Wonderful view just relaxing on the deck and watching the waves. Easy, short trip down to the water any time. Comfortably fit 2 adults and 2 kids, clean, original. Highly recommend.